The 2018 Range Rover Evoque luxury performance SUV is filled with a variety of innovative features. That includes many exciting infotainment features. The infotainment system has a 10.2″ touchscreen to control a variety of features. Use it to control the Navigation Pro System and the Land Rover InControl® Apps™. Link your smartphone to the system to control compatible apps through the touchscreen. 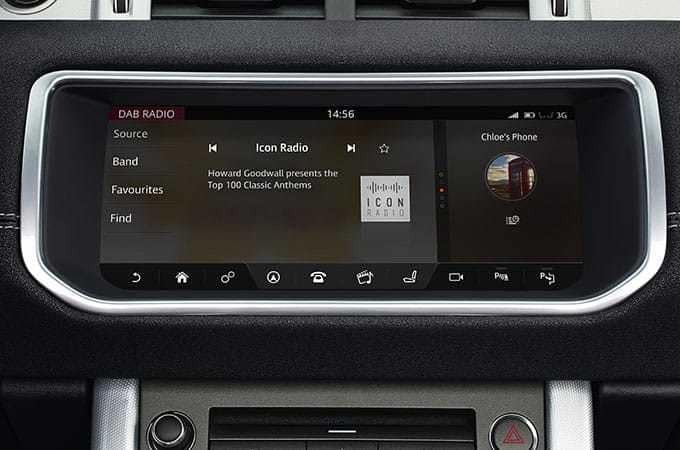 The impressive sound system is also controlled through the easy-to-use touchscreen. Enjoy your favorite music on the 380W Meridian Sound System with 11 perfectly placed speakers and a subwoofer. This system provides exceptional sound with excellent audio definition. Or choose the 660W with 13 speakers and a subwoofer or 825W system with 17 speakers and subwoofer. Land Rover Colorado Springs has several of the 2018 Range Rover Evoque models for you to choose from. Stop by today and let us introduce you to this luxury SUV!